in an exceedingly massive pot, pour in stock and water and produce to a mild boil. Whisk the soybean paste into the water mixture till all has dissolved. Let simmer for five minutes then add within the sliced curd. Let simmer for an additional five minutes then call in the strips of algae and season with salt, to taste. Divide equally into soup bowls and prime with scallions, if desired. 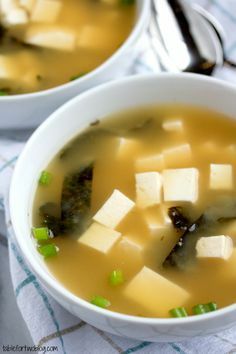 0 Response to "Easy 15-Minute Miso Soup"